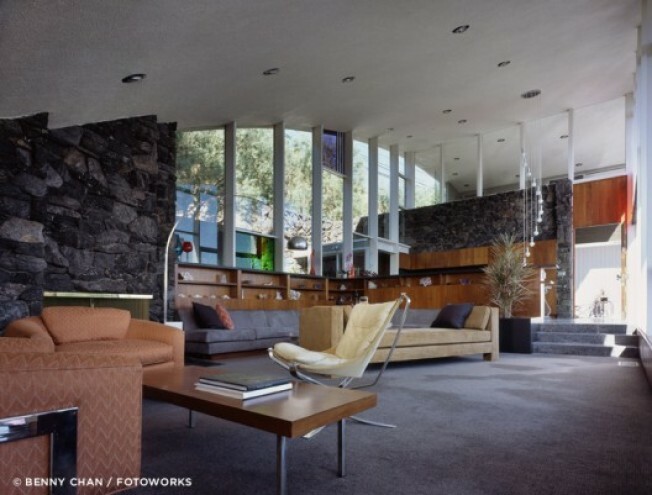 Here's your moment of envy: Check out the restoration of John Lautner’s 1962 Garcia House, which landed a big spread in last weekend’s Sunday’s Los Angeles Times magazine. Once described by the New York Times as a "Quonset hut made of glass," the home on Mulholland Drive was restored by local architecture firm Marmol Radziner and decorated by New York decorator Darren Brown. The home’s owners Bill Damaschke, an executive from DreamWorks, and his partner John McIlwee, an entertainment business manager, explain how they chose to decorate the home: They didn’t want super modern, but also "feared a caricature of mid-century modern.” Meanwhile, here are photos of what looks to be the interior before the renovation. Notably, check out the stairs. Famously or not famously, the home was in Lethal Weapon II, according to the New York Times, which also interviewed the couple a few years ago about the house. All images via Marmol Radziner.